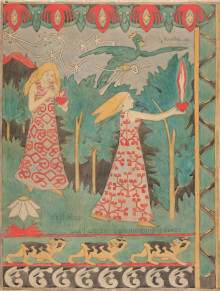 With renewed political support and the largest exhibition ever of multi-talented, pioneering Norwegian artist Gerhard Munthe, Norway’s National Gallery in Oslo is poised for another busy summer season. Busloads of tourists were already pouring into the museum on Wednesday, even before the Munthe exhibition debuts this weekend. The official opening is set for Thursday evening. Local media got a sneak preview of the exhibit that spreads over the entire ground floor, featuring everything from Munthe’s water colours depicting Norwegian folklore and history, to his furniture, tapestries, porcelain, silverware, bookbinding and other decorative works created until his death in 1929. Munthe was repeatedly described by the exhibit’s curator Widar Halén as a “pioneer,” inspired by Norway’s national romanticism of the late 1800s, its mythology and Viking history, and external forces including Japanese art and the Art Nouveau movement. 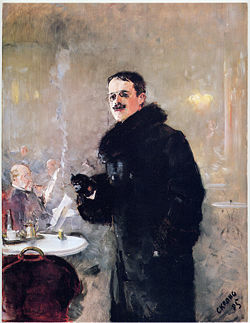 Munthe became one of the great Art Nouveau artists in Europe at the time, with his works and exhibits drawing large crowds from Paris to Berlin and Chicago. The National Gallery’s exhibit has been several years in the making, and features more than 230 works found both in the National Museum’s own collections but also in private homes, farms and even the historic home of composer Edvard Grieg in Bergen. 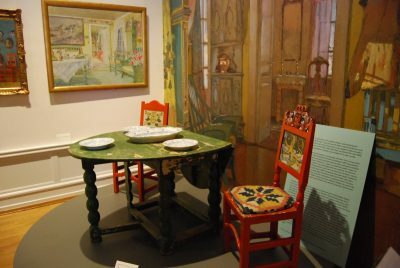 The National Gallery’s staff was able to borrow, display and recreate scenes created by Munthe, who was among the first Norwegian designers to work for industrial production. He was contacted, for example, by developers of the first Holmenkollen Tourist Hotel (which burned in 1914) to create its “Fairy Tale Room,” which resulted in Munthe creating special furniture, wall coverings, wood carvings, roof beams and stained glass windows. Only a few pieces of the furniture survived the fire, and one of the chairs is on display, set against a background photo of how the room looked. Munthe created silverware and other major pieces for Oslo retailer David-Andersen, porcelain for the new Porsgrunns Porselen Fabrikk at the time, designs for Hadeland Glassworks and interiors for wealthy owners of large homes. 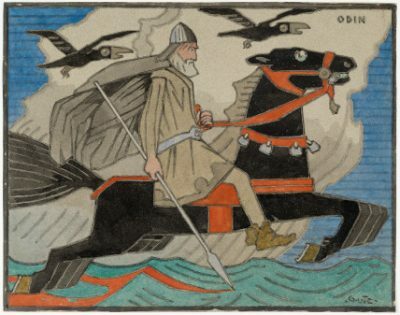 He was known for his vibrant colours and drew pictures of how he imagined mythological characters and Vikings looked. They have largely shaped how they’re still envisioned. Norwegian journalist, author and art critic Jan Kokkin has also written a book that’s being released in conjunction with the Munthe exhibition entitled Gerhard Munthe: Norwegian Pioneer of Modernism. The exhibit itself is entitled Enchanted Design, and runs until September 2, with guided tours in English scheduled on Sundays July 8, July 22, August 5 and August 19 at 1pm. As groups of tourists poured into the National Gallery Wednesday morning, the historic museum may also be getting a new lease on life.With construction underway on a new National Museum a few blocks away, on Oslo’s western waterfront behind the Nobel Peace Center, questions and debate have been flying for years over what will become of the National Gallery. 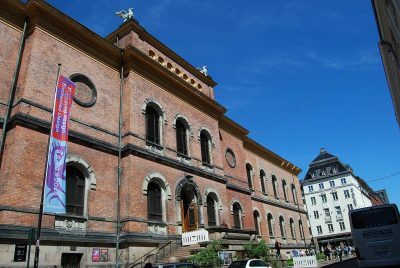 It’s part of the National Museum itself, along with the already shut-down Kunstindustrimuseet (The Museum of Decorative Arts and Design), the Museum of Contemporary Art and The National Architecture Museum. When Prime Minister Erna Solberg unveiled her expanded conservative coalition government in January, however, its official declaration included a sentence that the government wants “to preserve the National Gallery as an art gallery tied to the National Museum, provided it doesn’t lead to major costs for rehabilitation.” That sent champagne corks popping among those lobbying hard to keep the National Gallery intact. It’s long been popular not only with tourists but also with Norwegians both in and out of Oslo, with its room devoted to some of Edvard Munch’s most famous paintings (Munch Salen) drawing crowds all through the year. The National Gallery’s building is itself an historical landmark in downtown Oslo, with a popular and elegant café and museum shop. Fans of the National Gallery think it should be allowed to co-exist with the large new National Museum, where exhibit space may still be restricted if it combines the collections of all the other museums. Architect Fredrik Torp, who has been among those campaigning to “save the National Gallery,” was delighted by the government’s declaration of support. He firmly believes that the Munch Room at the National Gallery is one of the country’s most iconic exhibition rooms, and points out that there’s more than enough Munch art to show both in the new Munch Museum and National Museum under construction and the National Gallery.”We should preserve the older Munch paintings in the National Gallery and the newer Munch works in the new museum,” Torp told newspaper Aftenposten in January. He was also relieved that Trine Skei Grande of the Liberal Party was named as Norway’s new Minister of Culture in Solberg’s expanded government. She has been in favour of preserving the National Gallery, as have its new board leader Linda Bernander Silseth and new director Karin Hindsbo. National Gallery staff members remain uncertain and claim they still don’t really know what will happen, but the political winds seem to be blowing in favour of preservation, not least at a time when criticism has erupted over the form and design of the new National Museum. Its sheer bulk and grey brick walls, with no windows, have already drawn comparisons to a prison or a parking garage. Developers are pleading with the public to reserve comment until it’s finished, in 2020. An “Open House” is planned for next Saturday, June 16, when the public will get a chance to peek inside what’s still mostly a construction zone. Then everyone will have to wait for another two years, after its art has finally been moved in. In the meantime, Gerhard Munthe, Munch and other Norwegian masters are on display nearby.